Looking to teach abroad with a significant other or a group of friends? Here's everything you need to know! While it is entirely common for friends and couples to go abroad and teach English, to live together in the same apartment or city, you should not necessarily count on working in the same school. Some schools actually prefer not to hire friends or couples in case one leaves, the others won’t leave as well. Conversely some schools do prefer to hire friends or couples under the philosophy that those with the support and company of a companion will make a smoother transition to life and work overseas. Bear in mind that you may work at separate schools and still live and socialize together, and many couples and friends actually find it beneficial to work at separate schools because they are able to meet more English-speaking colleagues and widen their social networks. Make sure you concentrate your efforts in places where it is realistic for both of you to find work based on your backgrounds and qualifications. In some job markets, it can be difficult or impossible for people who do not have four-year degrees or who are not native English speakers to gain employment. 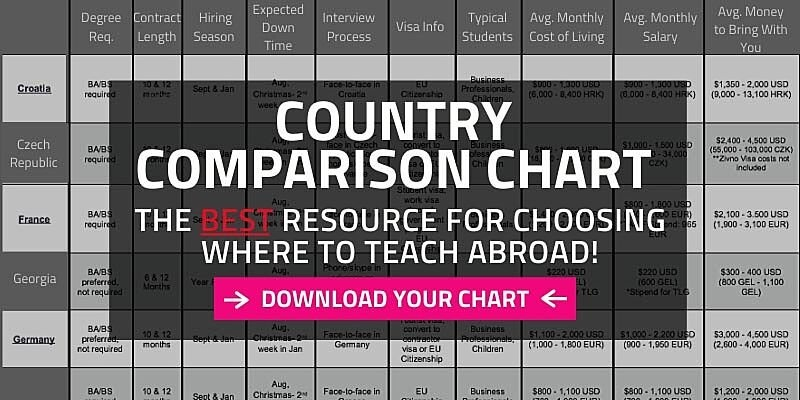 Consult your country chart, the country profiles on our website and with your TEFL Advisor to learn more about particular job markets. If you want to live and work in the same city or region, concentrate your efforts on going to major job markets where it is most that likely that you will both gain employment. This will typically include major cities in Europe, South America and Asia, which are often home to dozens if not hundreds of language schools. Follow the hiring seasons! In Europe and Latin America, hiring is concentrated during particular times of the year, when the majority of schools and language institutes conduct their hiring and recruiting. If you don’t follow these hiring periods, your chances of both landing good teaching opportunities decreases dramatically. With some exceptions most English teaching positions pay enough salary to support one individual. This means that unless you areable to line up an especially good paying job or you have access to alternative financial resources, both of you should count on working to ensure that you earn enough to support yourselves and to enjoy a comfortable standard of living. If you are married and one of you has citizenship in the country where you wish to live and teach, it will likely be easier for to gain employment, work visas and residency. Note that laws regarding these matters vary from country to country. It is critical that both/all of you speak with your TEFL Advisor. Your Advisor cannot provide accurate advice without knowing the circumstances of both parties and it is critical that the Advisor be able to directly address the questions and concerns of all involved. In this video, watch ITA Ambassadors Ashley & Tim share their experience living and teaching abroad together in Geochang, South Korea! Is it possible to teach English abroad with children?